Necklace. Resin, paper, pigment, silver, polyester thread. 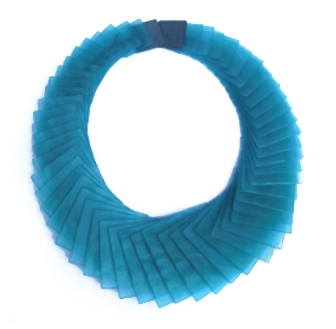 Yoko Shimizu received her Masters Degree from Alchimia Contemporary Jewellery School in Florence. 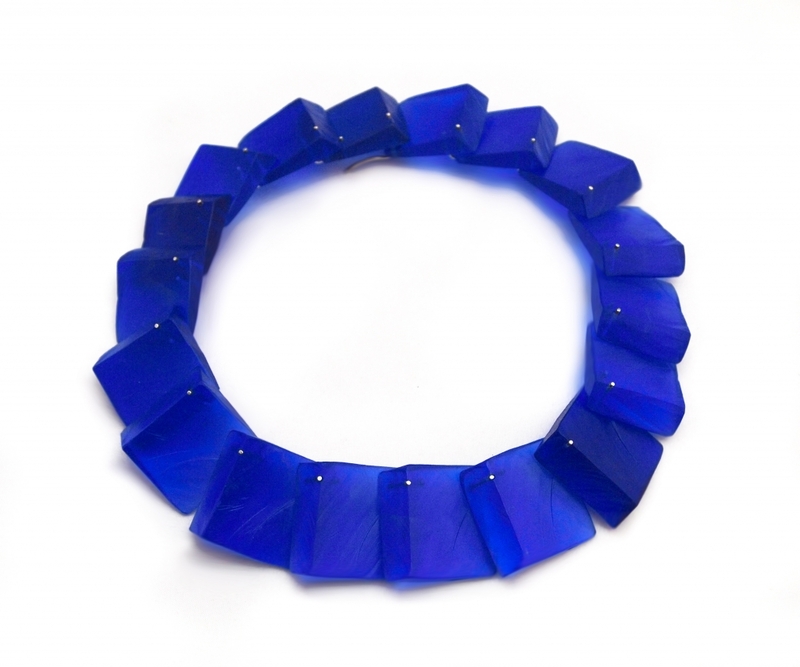 In her jewelry, she begins with a wooden form, transforming it in resin, and creating necklaces, earrings, and rings that seem to glow with light like colored glass. My approach to jewellery often begins with a focus on the relationship between the jewellery piece and the human body. I look for simplicity and harmony in this relationship through the process of making: experimenting with materials and forms, constructing one part at a time, pausing to see the effect on the body. In the end I feel the need to leave an imperfection or add or eliminate an element, so that there is something a bit off or unexpected. At times I am in search of tension, rigor and sometimes a touch of warmth. The theme of the series in colored resin is ‘Transformation.’ It is a part of a study in the transformation of forms, materials and colors. Pieces of wood are transformed into resin and the surface of wood is transferred onto the surface of resin. Transformation from wood to resin, from natural to artificial, from opaque to transparent. The transformation continues with the movement of the wearer and reflection of light, losing something but gaining something at the same time.